World Cat is the world’s largest maker of power catamarans, with over 80,000 satisfied customers around the globe. The origins of World Cat can be traced back over a quarter of a century to the beginning of Glacier Bay boats in America’s Pacific Northwest. Today, all World Cat boats are precision crafted in a state-of-the-art 140,000 sq. ft. facility in Tarboro, North Carolina. When it comes to delivering a better boating experience, you might say a World Cat boat beats a monohull two to one. That’s because the two narrower hulls of a World Cat slice through the water, which helps to eliminate the pounding, slapping, and jarring more typical in a monohull boat. Instead, World Cats deliver a smoother, gentler, more stable ride in virtually any conditions. That means owners can enjoy being out on the water longer, going farther, and coming back without the bumps, bruises and physical exhaustion often resulting from a monohull. Some of the other advantages of owning a World Cat power catamaran include much more deck and storage space, stability on the water and at the dock, greater fuel economy, maneuverability, and the peace of mind of having 2 separate power/fuel units, which means either motor can bring the boat on plane to get you home safely. The vast majority of our owners had previously owned at least 3 monohulls, and 93% of them say they would buy a catamaran (or strongly consider it) for their next boat. 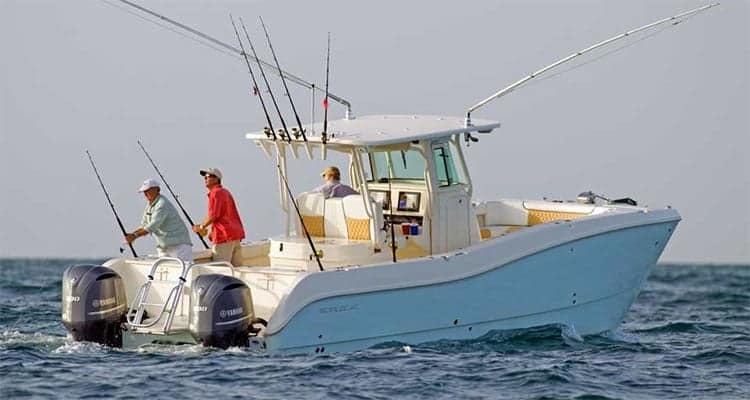 World Cat boats range in length from 23′ to 32′, and are available in Center Console, Dual Console, Cabin and Sun Deck models. They are just as comfortable serving as tremendous fishing boats as they are taking the family for an outing.